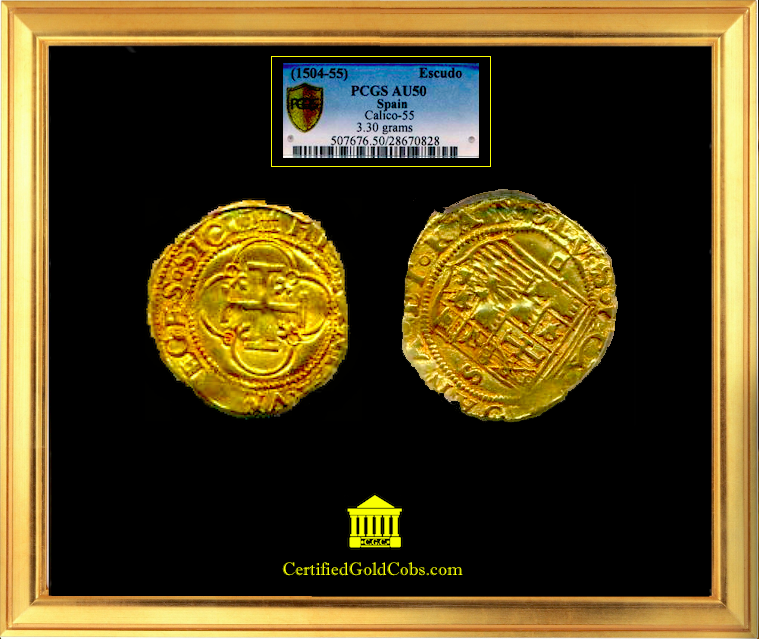 SPAIN GOLD COB COIN 1 ESCUDO 1504-55 GRADED PCGS AU 50! WHAT IS SO INCREDIBLE ABOUT THIS PIECE, IS THE NEARLY PERFECTLY ROUND PLANCHETT / FLAN AND THE STRONG STRIKE, ESPECIALLY IN THE LEGENDS. 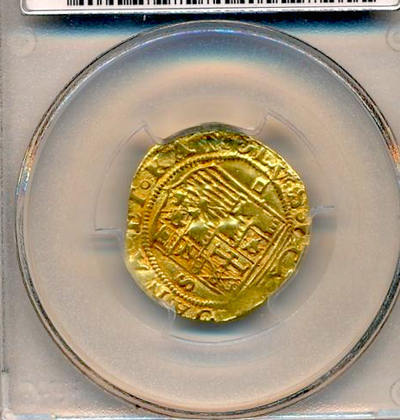 ON THE CROSS SIDE DEPICTING "HISPANIARVM REX" (KING OF SPAIN) AND "IOANA" (JOANNA) IN THE LEGENDS ON THE OBVERSE. JOANNA, AKA, JOANNA THE MAD WAS THE DAUGHTER OF FERDINAND AND ISABELLA (WHO ARE FEATURED ON SPAINS 1476 ISSUE (2 EXCELLENTE GOLD COIN). 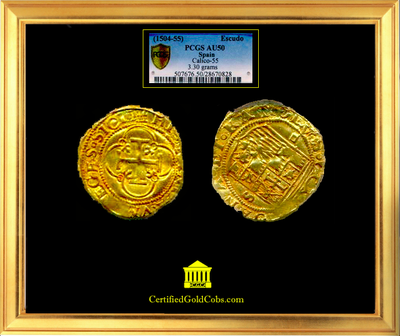 WHICH IS WHO CHRISTOPHER COLUMBUS GOT HIS FUNDING FROM FOR HIS EXPLORATIONS TO THE NEW WORLD (U.S.). SHE DID HAVE A BROTHER (FERDINAND) BUT HE DIED AT ONLY 19, SO SHE INHERITED HER PARENTS KINGDOMS (CASTILES & ARGON). 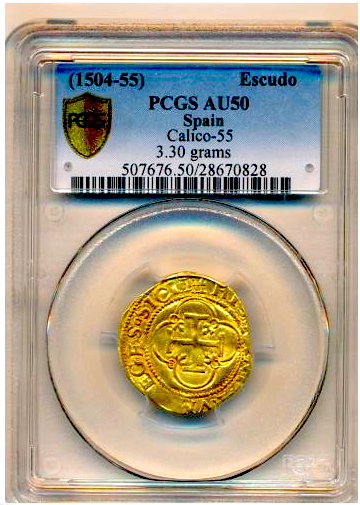 ALSO FASCINATING TO THINK ABOUT THIS COIN BEING STRUCK IN THE TIME OF THE SPANISH CONQUISTADOR "CORTEZ" WHO OF COURSE IS THE MAN WHO CONQUERED MEXICO (MAKING HIS 1ST TRIP IN 1517, 2ND TRIP IN 1518 AND FINAL TRIP IN 1519).